It's all the quality and advanced ingredients you rely on Maxi Health for. 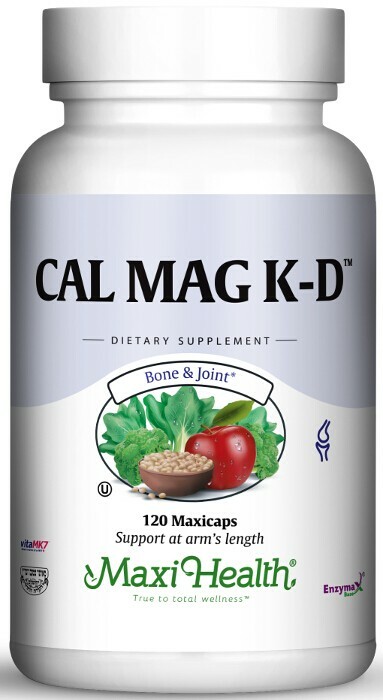 Get your Cal Mag K-D™ today. Take four (4) capsules daily, two (2)capsules in the morning and two (2) capsules in the evening with meals or as directed. Other Ingredients: Vegetable cellulose, rice flour, magnesium stearate, and Enzymax® (calcium carbonate, bromelain, papain, lipase, amylase, protease, silica). DiMaCal® is a registered trade mark of Albion Laboratories, Inc. This product contains NO wheat, gluten, yeast, salt, artificial flavorings, colorings, or preservatives.